With all of the augmented reality titles that have released on the Play Store in the last week, you may have missed out on Dumpling Co's AR Smash Tanks! It's an AR board game that is designed around smashing tanks by utilizing a simple slingshot mechanic for movement. Your goal is to fling your tanks into your enemies in order to deplete their health. Much like a physical board game, you have a set playfield that these battles take place on, and with the inclusion of AR, you can easily display that board on your coffee table at home or your desk at work. 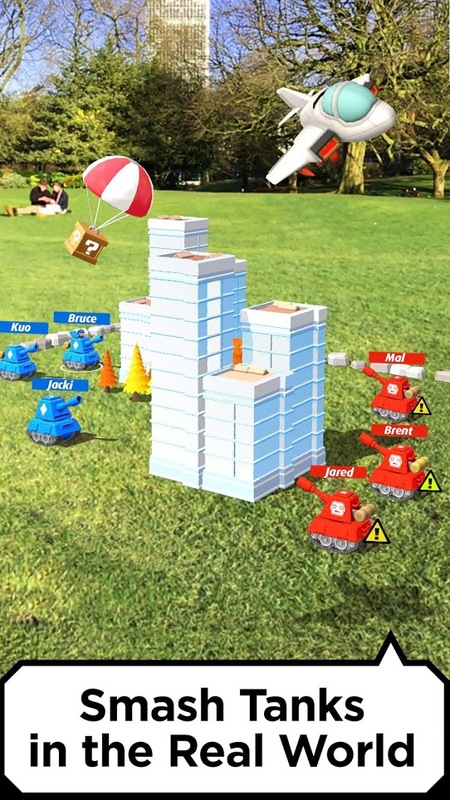 When you boot up AR Smash Tanks!, you will need to scan your immediate environment with your camera in order to find an acceptable place for the board. This is automatic, but it can be a pain. The AI ultimately decides where the board goes, and it isn't always optimal. Of course, you have a few adjustments at your disposal once an area is chosen, but this movement is limited. Once a clear space is filled with the game's board you will then have a choice of a few different modes to play through. The first mode is a single player experience that will have you battling against the AI. The second mode is for multiplayer gameplay, and it works through a pass and play system that allows you to use one device to play with a friend locally. And the third and last mode is also a multiplayer experience, but this one works online against friends you have connected to your Google Play Games account or people that happen to be sitting next to you that also have the game installed on their own device. Each of those modes play exactly the same. You start out each match with 3 tanks, and it's your goal to smash them into your opponent's tanks in order to deplete their health by flinging them across the board. The first to win 2 matches is the victor. There are also a few power-ups that will drop randomly. These contain a couple of different projectiles that can be used to get a leg up. So when you see one drop, try to grab it before your competitor does. 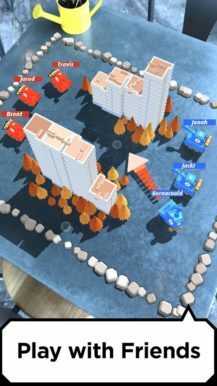 As for the controls, they work as intended, and I have to admit, the inclusion of AR makes walking around the board for a better view of your next move a pleasure. One downside is that I couldn't help but notice the back of my S8+ getting increasingly warmer the longer I played. On the plus side, this is a premium release that can be had for $1.99. There are no advertisements or in-app purchases, and it would appear that a Google Play Games achievement system will be coming soon. I'm happy to report that AR Smash Tanks! 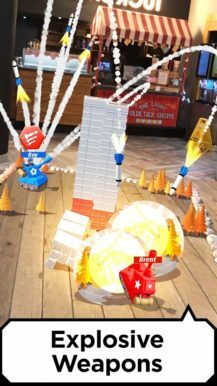 is a fun little augmented reality release worth the asking price. Smashing your tanks into your opponents before they have a chance to take you out is often very satisfying, and the additional power-ups add an extra layer of enjoyment that is hard to match. Plus the slingshot controls are intuitive and work really well. So sure, this may not offer a deep experience that you play extensively for long bouts of time, but it sure makes a great time waster to play with your friends in a few impromptu sessions at your local pub or restaurant.